and I am planning for the next hand quilting project. 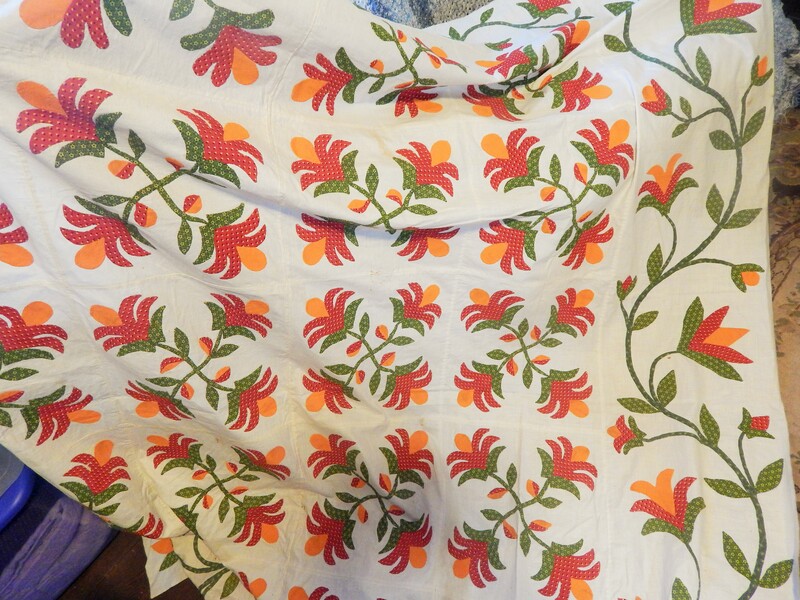 This mid 19th century top is the next big project. This is a special project that I am doing for a good friend and quilt collector. 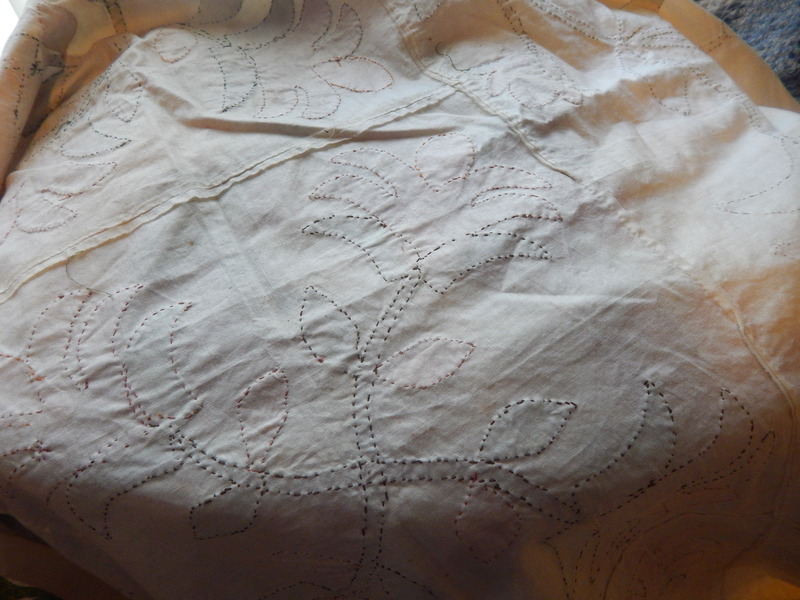 here is the back to show the stitching. It will be a few more days before I start this but I will be sure to post lots of pictures as I work on it. 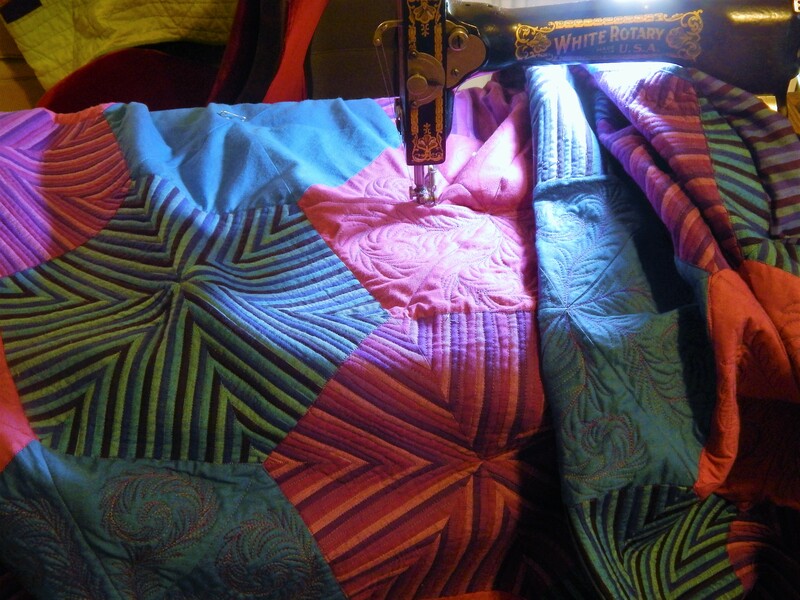 The quilting on this will be very dense so it will not be a fast finish. 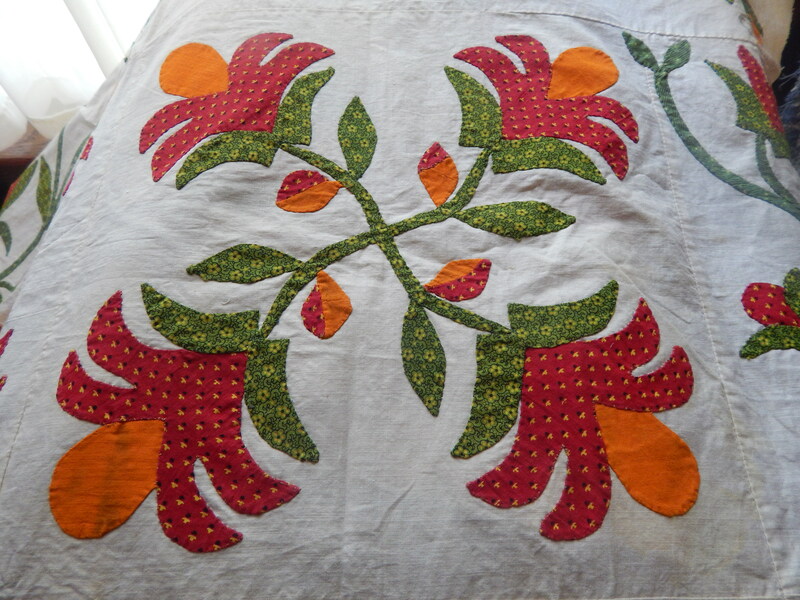 This entry was posted in Garden, Quilts and tagged antique quilt top, flowers, Garden, hand quilting, Quilts. I’m so excited that this will be your next project. That top is unbelievable gorgeous!! I can’t wait to see how you quilt it!! Oh, my what a stunning quilt that next one is! Not to say that the current quilt isn’t, but the next one really is breathtaking. 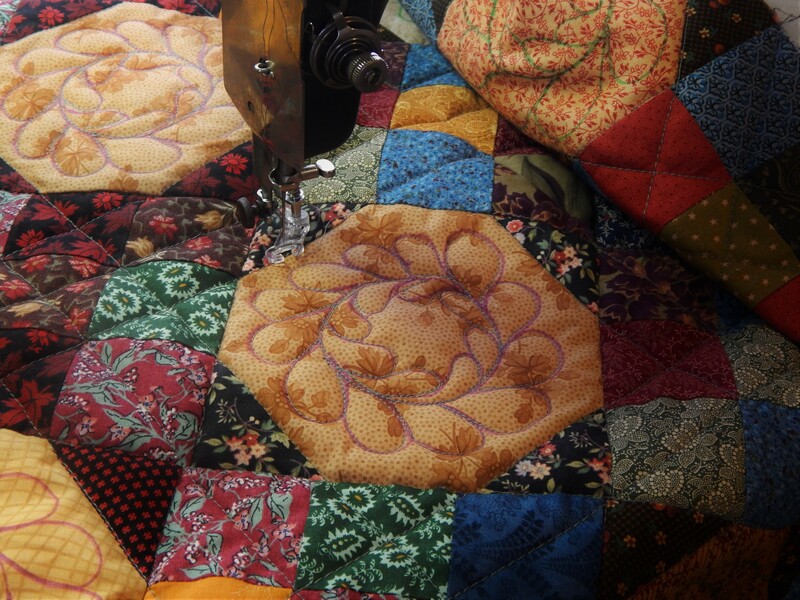 It’s going to be fun to watch it come to life with your quilting. That is certainly a WOW quilt! I know you will do it justice! Yes, every time I see it again it reminds me how amazing it is — really pops, and at @ 150 years old! Wow! Love this quilt. Fabulous applique work! 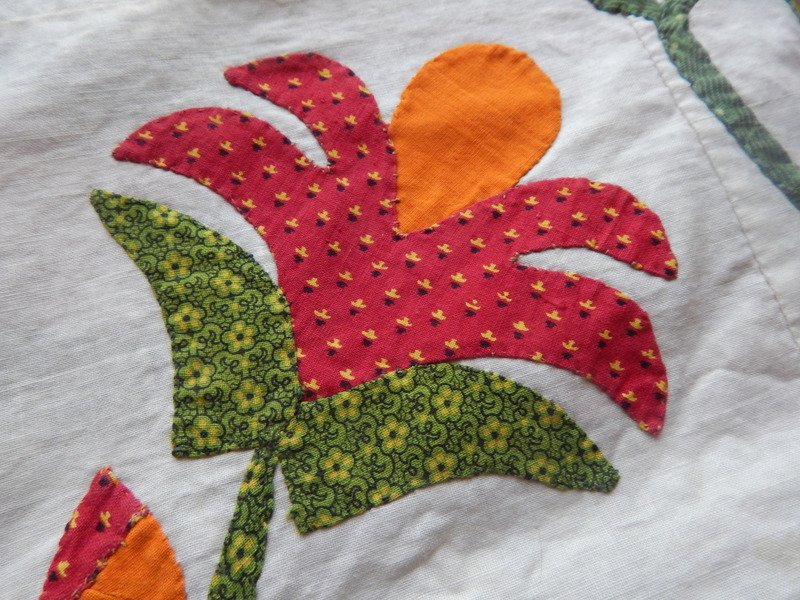 it sure is…..I am always impresses with applique because I am so bad at it! Tim, it’s always fun to see a project nearing the end! Nice work! 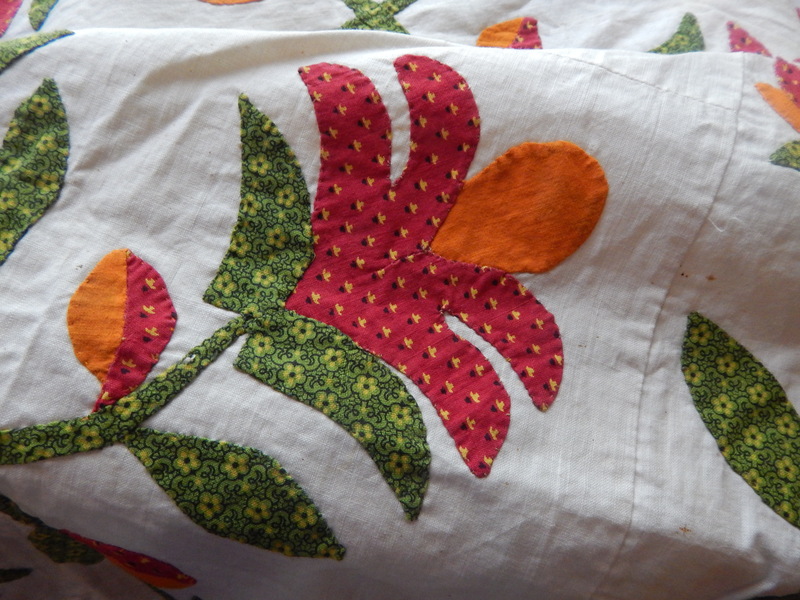 The appliqué quilt is wonderful! Lovely piece of history! 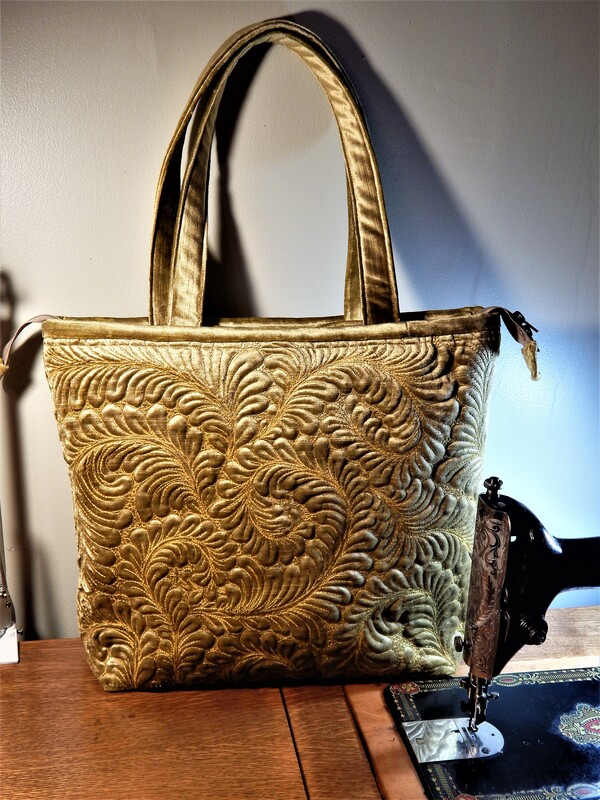 I don’t do appliqué ! Tried it once and it ended up in the trash! I spent lots of time weeding today. I love my gardens but the weeds are crazy bad this year! Love the new quilt project. Applique is my love and this is nicely done by the pictures. The new project looks great. 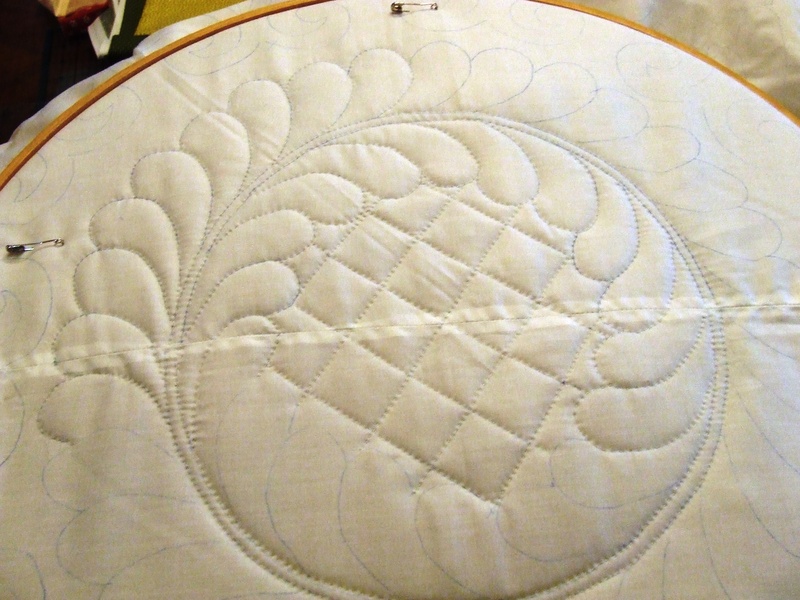 I’m trying to motivate myself to get my son’s quilt basted so I can begin hand quilting it this fall. Lovely flower photos. basting is my least favorite part! That applique quilt is absolutely beautiful! I look forward to seeing how you quilt this one! You have a fantastic flower garden! 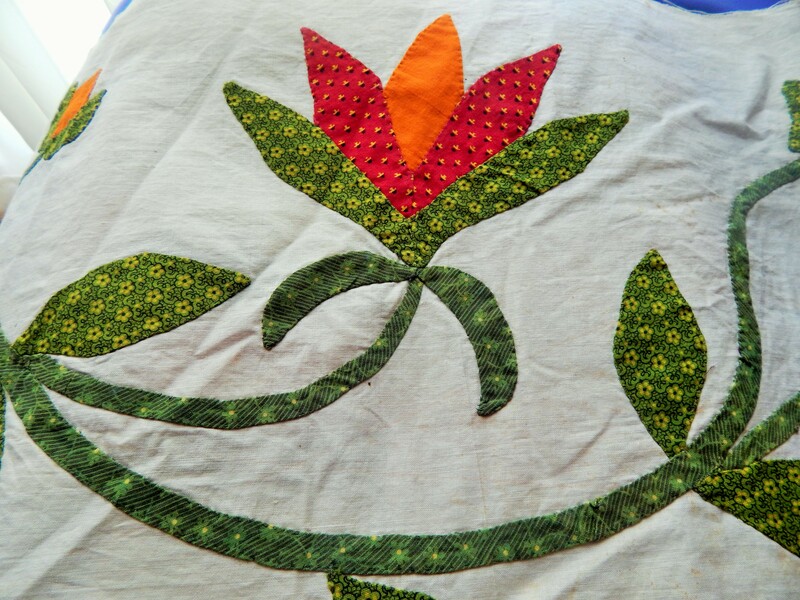 The applique quilt is absolutely marvelous! It will truly be a treasure when finished. Your garden is awesome! 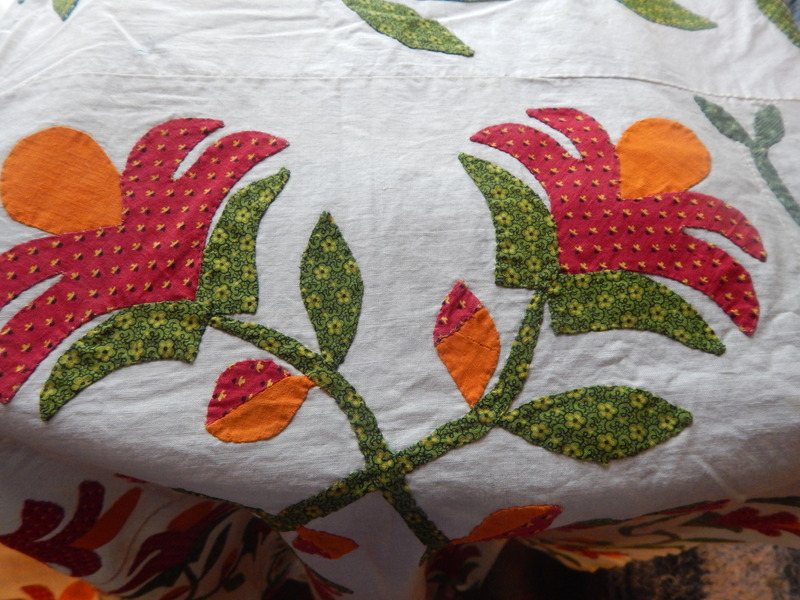 Do you have a name for this applique pattern & a date from the owner? 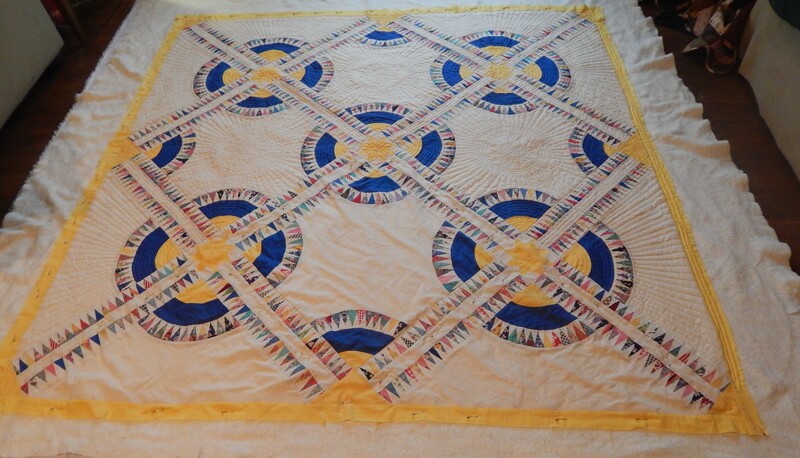 There is a crib quilt on the Vintage Blessing e-bay site that is called “Crossed Tulips” that is a similar pattern to this design. It is a somewhat simplified version. Wow, wow, wow!! What a gorgeous quilt. Can’t wait to see how you quilt it. The colors are amazingly bright-looks like it was well cared for. Love the flower photos. I really miss my clematis and climbing roses. ( My New Dawn froze to the ground this year, too) I have to figure out where I can put some of both here. I do the wow wow wow myself every time I look at it….its going to be a true pleasure to work on it! I think I’ll take a cutting of my New Dawn and root it for here. I was sad that it froze because it was so incredibly lush for the last several years; it had grown up over the garage roof (we bent coat hangers to hold it up along the eaves trough, and it bloomed like CRAZY- really lovely. Yes, I actually have one of the non climbers; got it at one of the Cooley Plant Sales. It is the most amazing shade of blue. The problem is that it is SO low that you really have to be looking for the flowers. I planted it next to a ‘Walker’s Low’ catmint with the mistaken idea that it would scramble through the mint. The clematis had other ideas! PS Love your rose ‘Verdun’. Gorgeous!